For all of you animal lovers I decided to dedicate a page to man's best friend. To my best friend Katie. For the past twelve years Katie has heard every song I've written, from the first chord to the last note and everything in between. She was there during the recording process from beginning to end and as you may or may not know, she sang the last note on the "City Lights" CD. Katie knew before I knew when I was about to practice, record or write. She would be waiting for me in my studio….. she had the uncanny ability to just know. Every musician who has ever come to my home to rehearse or record knew Katie. Even the musicians who were a little skittish of Katie (Jimmy Seay) eventually Katie would win them over. Katie and Jimmy became best friends. I think Katie was a musician at heart and just wanted to be a part of the band. I know all of the band members take great pride in honoring Katie when we perform Katie's song. 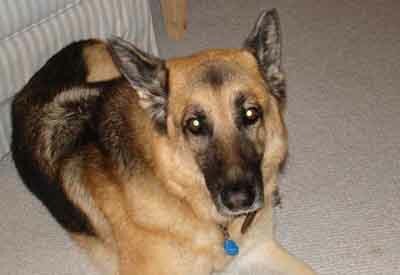 I recently lost Katie to old age but I will never forget her. My studio is not the same without her. When I wrote Katie’s song I knew from the beginning this song was for her. The chords and melody best describe Katie’s personality. There is a purity and sweetness to this song that was Katie. I also did not want to over produce the song; I really wanted to keep it pure just the way I wrote it... no re-writes, no changes. What you here on this CD and live is exactly the way it was written. Katie knew this was her song and every time I played it she would perk up and give me that look.